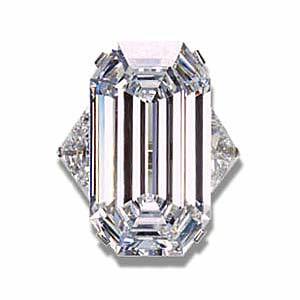 The La Favorite, a 50.15-carat D-color, VVS-2 clarity, with the potential for being flawless if it were to be slightly recut. It is set in a ring by Bulgari. The La Favorite was mined in South Africa and made its debut at the Chicago World's Fair in 1933, when it was owned by a Persian and valued at $1 million. The diamond was a sensation during the Depression; people waited in lines to see the rock. In the 1960's, it was sold to a Frenchman. The piece was purchased by Laurence Graff for $3,636,000 in April, 2001, at Christies Auction House, New York. 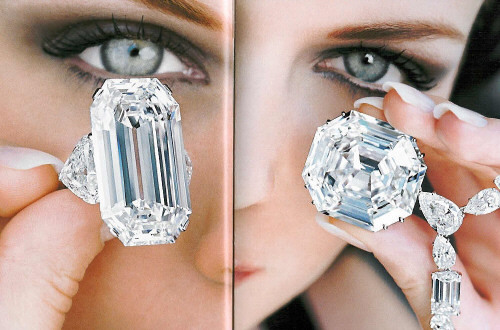 The La Favorite, with the Star of America (right), 50 and 100 carats, respectively. Both are owned by Laurence Graff.